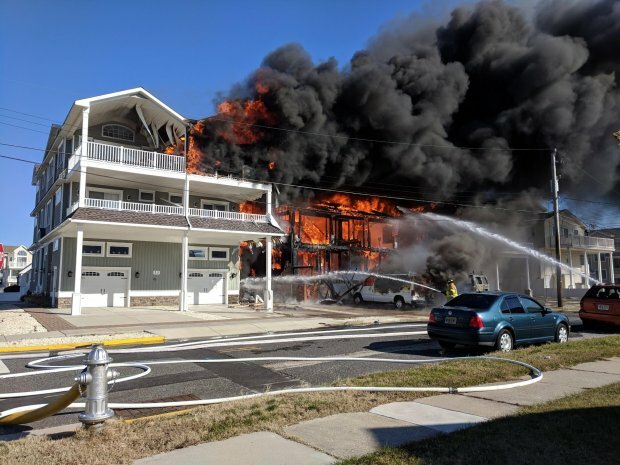 SEA ISLE CITY — Authorities searched Thursday for a woman missing after a large fire reduced a half-million-dollar home to a smoldering pile of debris, injuring two people. The Cape May County Prosecutor's Office described the unaccounted-for person as an elderly female. Two residents were taken to area hospitals. Authorities did not provide identities for the injured as well as the missing one. Three side-by-side duplex homes, with a total of six units were damaged by the fire and smoke. Fire crews worked quickly to protect other neighboring homes on the block.